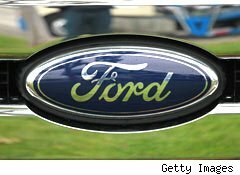 Shares of Ford (F) fell sharply on Friday after the company "missed," reporting a quarterly result that fell below analysts' expectations. Not counting some "special items," Ford's profit last quarter was $1.1 billion, or $0.20 a share. That's significantly below the $0.26 a share expected by analysts, and well below the $0.30 Ford made a year ago. That strongly suggests some ongoing weakness in the auto giant's global operations. But despite the disappointing profit number, Ford's core business is actually in great shape. First and foremost, automakers live or die by their products. Ford's product line is first-rate, maybe the best it has ever been -- and arguably among the best in the world. Ford vehicles like the Focus and Fiesta are fully competitive with -- maybe even better than -- similar cars from Toyota (TM), Honda (HMC), and other global leaders. And for the first time in its history, Ford is selling the same basic lineup of cars in markets around the world. The Ford Fiesta that is one of Europe's top sellers is the same Fiesta that you can buy at dealers in the U.S. The Ford Focus that has become a market leader in Russia -- and happens to be produced in a Ford factory in St. Petersburg -- is the same car that Ford also makes in Detroit and sells here. That wasn't always true. For years, Ford made different versions of its cars for different markets. The Ford Mondeo, a midsize sedan sold in Europe, was a completely different car from the midsize Ford Fusion sold here. And the same thing was true for the Focus, the similar Ford Kuga and Escape SUVs, and other Fords in other markets. Two huge budgets, two huge efforts, and two sets of parts and suppliers and engineers. For two cars that were basically the same. As Ford CEO Alan Mulally told me awhile back, while talking about what he found when he arrived at Ford in 2006, "That just never made any sense." Needless to say, Mulally has ensured that Ford's not doing that anymore. The striking new Ford Fusion that was the hit of the Detroit Auto Show is the same car that will be rolled out -- wearing Mondeo badges -- in Europe later this year. The all-new 2013 Escape SUV is also the Kuga SUV that Ford will be building in Germany. One set of designs, sold around the world. That allows Ford to maximize its investment in each new car and truck. That in turn makes for better quality, which allows Ford to get better prices, which gives Ford more money to invest in the next round of vehicles -- and strong profits, even during tough times. Ford calls this its "One Ford" plan, and it's the key to the company's remarkable turnaround -- and the reason Ford continues to be solidly profitable in a tough economic environment. And make no mistake: While things are looking up somewhat in the U.S., economic conditions around the world remain challenging. Ford's North American division actually posted a hefty profit increase -- $889 million for the fourth quarter, up from $670 million a year ago. Ford's selling more cars and trucks here, and it's selling more of its most profitable models (trucks, SUVs, and cars with lots of options). That's all great news. The story around the world is less cheery. Ford lost money in Europe and Asia, and posted just a thin profit in South America. Europe, of course, is suffering from rough economic conditions due to debt crises and deep government cutbacks. Those conditions have forced other automakers, including rival General Motors (GM), to discount heavily or lose sales, making profits scarce for all of the major players in the region. In Asia, Ford suffered some production losses as a result of severe flooding in Thailand, but the news isn't all bad -- the company is building new factories in China to meet demand there, and those costs cut into profits. And in South America, particularly Brazil, Ford's in the middle of a major product transition. Within a couple of years, the region will be fully on board with the "One Ford" product lineup, and that should help increase both sales and profits. In the meantime, profits are slim. Long story short, Ford's mostly in great shape -- and if only the world's economies would cooperate, it would have the numbers to show for it. The company's debt is down, its cash position is strong, its products are excellent and continuing to gain traction, and its margins -- the amount of profit it makes on each sale -- continue to improve. It might be awhile before the stock catches up. But for those with some patience, right now could be a good buying opportunity. At the time of publication, Motley Fool contributor John Rosevear owned shares of Ford and General Motors. The Motley Fool also owns shares of Ford, and Motley Fool newsletter services have recommended buying shares of General Motors and Ford. Motley Fool newsletter services have also recommended creating a synthetic long position in Ford.